That’s the name of my new band. I kid, I kid. For someone who gets a huge kick out of Team USA cards, you’d have figured I’d be camped out in front of Walmart waiting for them to arrive. It was nearly a month ago that they were released and only this week did they finally show up at my local brick and mortar. 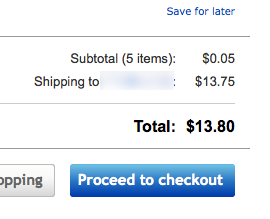 If you’d like to know why I end up ebay/COMC’ing 99% of my collect, there you have it. No LCS, laggy distribution at my local stores. I digress. This isn’t a rant about Excell’s handywork in my area, it’s a post about baseball cards. On Friday, I won 5 auctions from the same ebay seller. $0.01 each. $2.75 for shipping, FOR EACH. The seller won’t combine shipping, despite it being listed as part of the auction. Ebay CS told me that sellers don’t have to combine shipping, and aren’t obligated to do so, and it’s nothing they can reprimand them for. I totally understand not combining shipping on larger items (video games, clothes, etc), but we all know these are baseball cards. They could all fit within a single envelope, with hardly any additional weight. So, what would you do? Pay the shipping and give them five 1-star ratings? Not pay and tell them to go stuff it and take the negative feedback? $14 isn’t the end of the world, but it’s sort of the principle of the thing on this one. Pat from Hot Corner Cards surprised me with a PWE this week. He saw my Brock Holt collection post and chipped in two I didn’t have. I hadn’t bought any Archives and very little Heritage this year, and each product had a Holt I was missing. Archives is a love it or hate it sort of product and I can’t really claim to be on the “loving it” side of the fence. I don’t have any problem with the concept of re-using older designs, but it seems like this year they just picked them completely randomly. 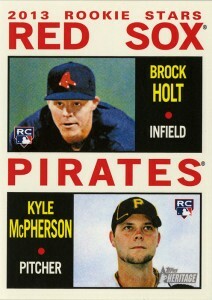 I’ve very happy that Brock here isn’t on one of the designs from the 90’s. 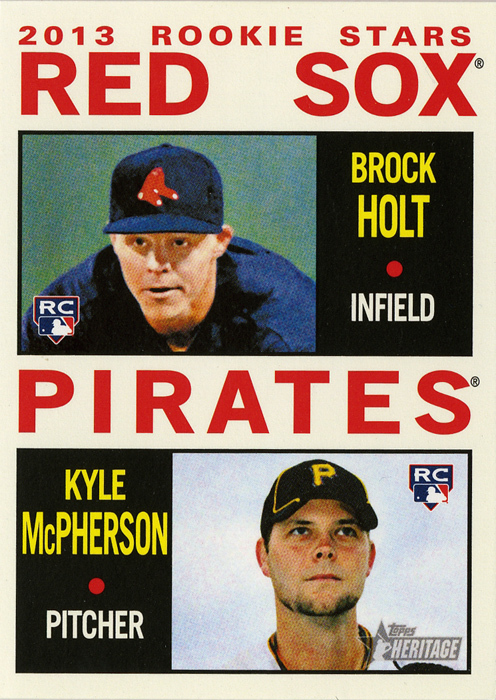 A nice split-card with Kyle McPherson from the Pirates, which I can only assume is intentional since Holt was traded from the Pirates. Heritage is a set I could totally “get behind” if the set wasn’t so insanely large and if they’d stop friggin’ putting Ortiz as a short print. That’s just mean. 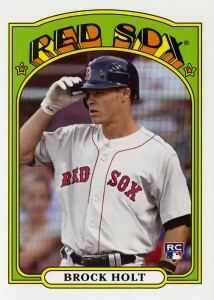 That said, another awesome Holt RC off my checklist. A big thank you to Pat, these are completely awesome and go directly into the collection! Thank you sir! 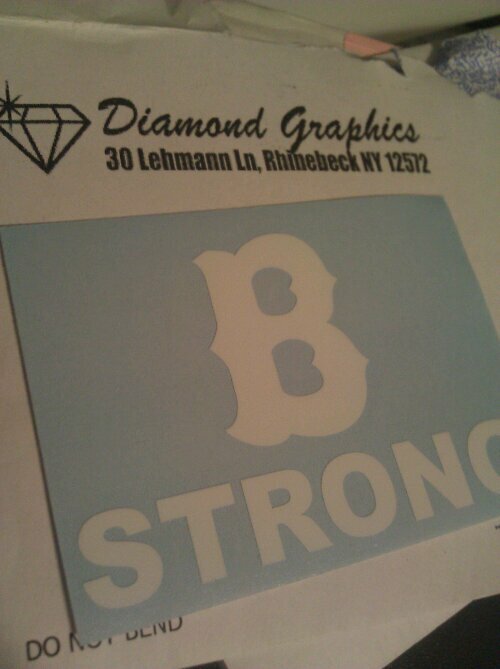 Anyone recognize “Diamond Graphics” in Rhinebeck NY?